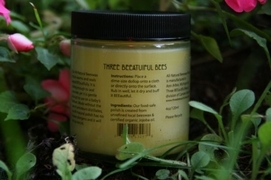 Three BEEautiful Bees All Natural Beeswax Polish is all you need to maintain your Camden Rose bowls, rattles, and teethers. 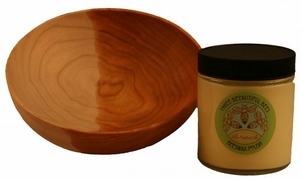 Although this beeswax polish is perfect for caring for wood, it also effectively conditions leather. This beeswax polish is the highest-grade unrefined beeswax from Michigan apiaries. After the impurities are removed, Three BEEautiful Bees heat-blends the beeswax with food-grade, certified organic jojoba oil to prevent any wax build-up. The resulting consistency of the beeswax polish is unique, smooth, and lustrous. It is strong enough to seal concrete, yet pure and gentle enough to use on a baby's bottom! Absolutely NO petroleum distillates are in this all-natural polish, it has no known allergens, and it will not go rancid. To use, simply dip a cloth in the jar of beeswax polish, apply to your item, let the item dry, and buff to a shine. 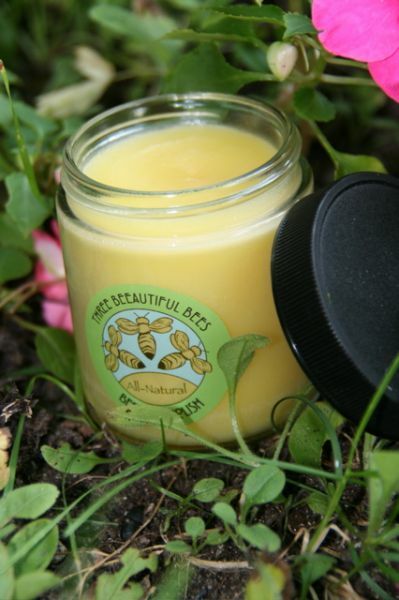 Three BEEautiful Bees' beeswax polish is so easy to use and smells wonderful. A little bit goes a long way. It is wonderful to watch wood and leather gleam as they are rejuvenated by this amazing polish. We love to use it on our Camden Rose items, as well as wood cutting boards, leather shoes and gloves, and even saddles! Three BEEautiful Bees' beeswax polish is certified non-toxic and made from pure, unrefined beeswax. The jojoba oil is 100% certified organic. Absolutely no petroleum distillates or other chemicals were added to the beeswax polish. Three BEEautiful Bees (Three Beautiful Bees) is a subsidiary of Camden Rose. Based in Ann Arbor, Michigan, Camden Rose is a collective of designers, artists, teachers, musicians, craftspeople, and parents, who design and manufacture simple, elegant, and unique wooden and textile toys. Green natural materials and USA and Fair Trade manufacturing highlight Camden Rose's "leave no footprint" philosophy. Camden Rose does not mass produce toys. Each toy is constructed one-by-one, the old-fashioned way to last for generations. Camden Rose uses completely natural materials that are gathered through organized sustainability programs. These natural materials, such as wood, silk, wool, and beeswax, have a warm and honest quality that--unlike plastic toys--do not give a false impression of weight, mass, or touch. As such, Camden Rose's items portray our world to children honestly, allowing a child's creativity, free thought, and imagination to shine. We are honored to bring Camden Rose's exceptional products to you and are pleased to support this collective of artists dedicated to creating toys that inspire the imagination.